Regardless of the connections on your drum module, we recommend that you get a dedicated audio interface for music production. Not only does it help keeping the latency at a minimum, it also gives you proper balanced outputs (instead of the headphone jack on your laptop). With that said, you could get decent results with your computer’s built-in sound card, using Core Audio drivers in OSX or ASIO4ALL drivers in Windows. Now that you have all the necessary gear it’s time to set up your e-drum kit so that it triggers the sounds in Addictive Drums. If your e-drum kit is connected to your computer directly via USB, go to the e-drum manufacturer’s website and get the latest software drivers for your kit. If your e-drum kit is connected via MIDI In on your audio interface, make sure that the audio interface drivers are installed and up to date. 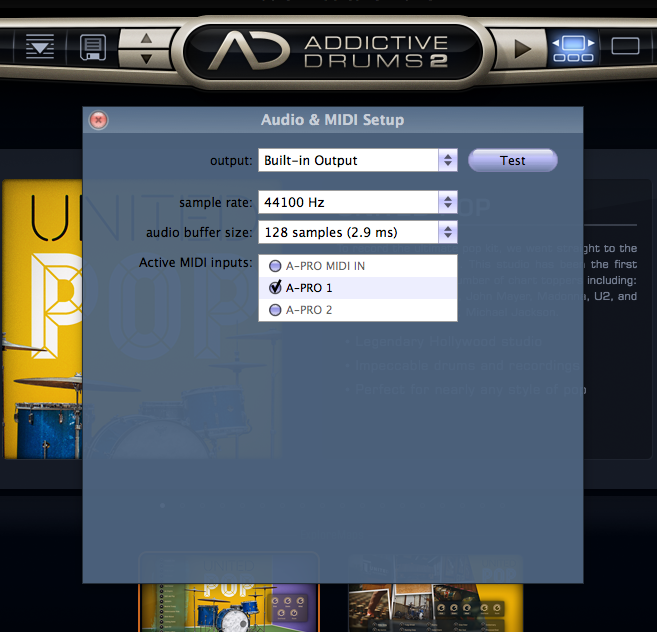 The next step is to load up the Addictive Drums 2 standalone application. You can of course trigger the sounds in Addictive Drums 2 while it is loaded as a plug-in in your DAW, but we will focus on the standalone version for this article. Click the [Audio & MIDI Setup] button in the top left corner of Addictive Drums 2 (if you are running the plug-in version of AD2, these settings will be available in your DAW preferences). Depending on how your e-drum kit is connected to your computer, either the name of the e-drum kit or your audio interface should be present in the Active Midi Inputs list. Check the box next to your device to enable it. Now it’s time to load up the Map Window in Addictive Drums. You can find it in the menu that pops up when you click the [?] button in the top right. Try hitting a pad on your e-drum kit and keep an eye on the MIDI MONITOR in the top left of the Map Window. If you have done all the previous steps correctly, the Midi Monitor should flash and give info on the incoming midi message. The last thing you need to do is to make sure that the pads on your e-drum kit trigger the correct sounds. Addictive Drums 2 includes Map Presets for over 30 e-drum kits. Try the MAP PRESET dropdown box in the top left of the Map Window. If your e-drum kit is listed, simply select it and the mapping will adjust to your kit automatically. 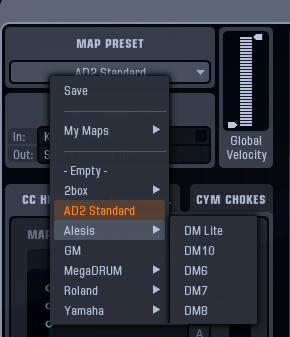 If your e-drum kit is not listed, but other models of the same brand are - try loading a Map Preset for another model. Chances are that the mapping is, if not fully compatible, then at least a good starting point for a custom Map Preset. Creating a custom Map Preset is really easy. In the Map Window, click the [SNARE] button to list all the available stroketypes for the Snare. Then click the [Learn] button next to Snare Open Hit and hit the snare drum pad to assign the sound. If you have a separate zone for the rim (meaning the rim sends out a different midi note than the center), then you can assign that to Snare RimShot or perhaps Snare Sidestick. After that, just follow the same procedure for the Kick, the Toms etc. until you have mapped out the whole kit. You can also drag a stroketype from the list and drop it straight onto the keyboard on the right. Don’t forget to save the Map Preset when you’re done, so you can easily load it up the next time you need it. You can even set your custom Map Preset to be the default by clicking the appropriately labeled button [Set this as my default]. Now you're ready to rock!